Swedish Melodic Death Metallers SCAR SYMMETRY, will embark on a North American headlining tour this September, issued Nuclear Blast. Joining them are label-mates ARSIS along with SHATTERED SUN and PAINTED IN EXILE. ”We’re proud to announce the dates and venues for our first North American headlining tour this September! As you can see, we’ve chosen to keep this tour on the short side – but rest assured the shows will be of full length and girth! With us on this metal pilgrimage we have Virginia tech-death overlords ARSIS, Texas metalcore masterminds SHATTERED SUN and New York prog professors PAINTED IN EXILE. 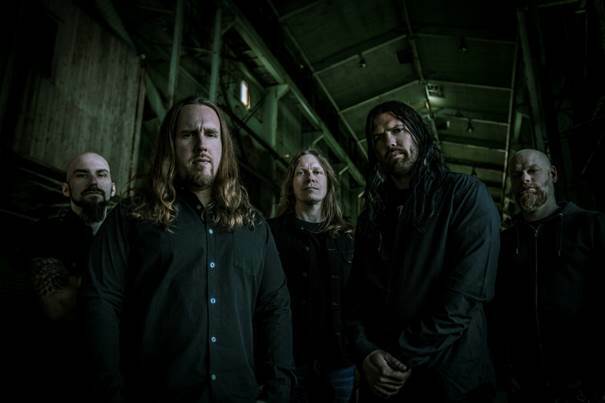 SCAR SYMMETRY’s sixth studio album, The Singularity (Phase I – Neohumanity), landed at #13 on the Billboard Heatseekers chart in the U.S. upon its release in October 2014. The album also debuted at #49 on the Billboard Hard Rock/Metal charts and #90 on the Canadian Hard Rock/Metal charts. Artwork for The Singularity (Phase I – Neohumanity) was created by Mircea Gabriel Eftemie (CARCASS, BRING ME THE HORIZON, VOLBEAT). The album was recorded, mixed and mastered by Per Nilsson. After initially launching with a high caliber roster including the likes of Glen Drover, Jason Bittner, Bjorn Strid, Doc Coyle and many more, METAL FOR HIRE has just added a second round of talented musicians to their ranks. With many more artists to join METAL FOR HIRE, this unique stop for metalheads offers an incredible opportunity to the musicians and new and upcoming bands/artists. Dutch Symphonic Metallers EPICA will embark on a Nationwide UK tour this coming November, they are in support of 2014’s critically-acclaimed studio album ‘The Quantum Enigma’. Epica performed a magical set in London in December last year selling out The London Forum as part of their European Enigma tour. The band are now thrilled to announce dates across the UK for this winter. Support comes from 2 Nuclear Blast label mates. Switzerland’s ELUVEITIE released a new album last year, the Celtic Folk influenced ‘Origins’, which they performed at a string of sold-out UK dates last Autumn. “We’re some eight months into the Origins World Tour; from Switzerland to India, from Europe to North America, from clubs to festivals, this is shaping up to be our most extensive tour yet, and it has already included some of the most memorable Eluveitie shows to date. Yet we are far from tired! Better yet, we have saved a proper highlight for autumn 2015: together with the incredible Epica, we are getting ready to bring what’s bound to be the tour of the year to the stages of Europe – and, finally, the UK again! Swedish melodic Death Metal band SCAR SYMMETRY complete the bill, performing their first UK dates since the release of their new album ‘The Singularity Phase I: Neohumanity’ , also released in 2014. The artwork of “The Singularity (Phase I – Neohumanity)” was created by Mircea Gabriel Eftemie (CARCASS, BRING ME THE HORIZON, VOLBEAT), who will be designing the artwork for the whole trilogy. Swedish Melodic Death Metallers SCAR SYMMETRY will release their new album »The Singularity (Phase I – Neohumanity)« and successor to 2011’s highly acclaimed masterpiece »The Unseen Empire« on October 03 (EU), October 06 (UK & France) and October 14 (US) 2014 via Nuclear Blast. »The Singularity (Phase I – Neohumanity)« is the first part of a trilogy of releases. Today the band released a new lyric video for the song “Cryonic Harvest”. The cover artwork for »The Singularity (Phase I – Neohumanity)« was created by Mircea Gabriel Eftemie. Swedish melo-death metallers SCAR SYMMETRY are set to release their new album and successor to 2011’s highly acclaimed masterpiece “The Unseen Empire” this fall. The new creation called “The Singularity (Phase 1 – Neohumanity)” will be out on October 03 (EU), October 06 (UK & France) and October 14 (US) 2014 via Nuclear Blast and is the first part of a trilogy.